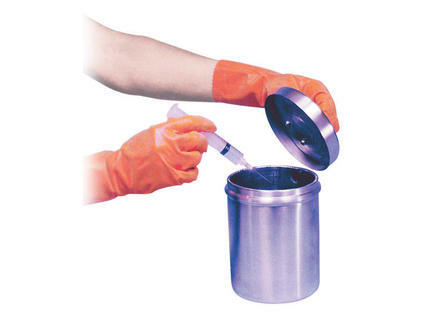 Shielded Storage Containers are useful for storing used syringes, alcohol wipes, etc., that may be contaminated with low-energy gamma or beta radiation residue prior to disposal. 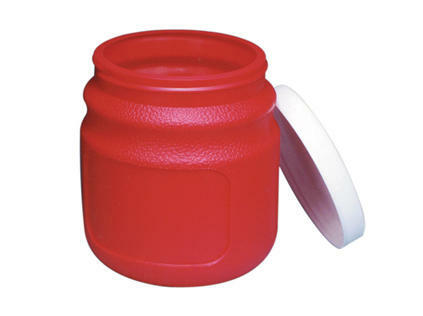 The 050-200 and 050-250 Storage Containers are constructed of stainless steel lined with .125" lead (.32 cm.). The 050-205 is constructed of stainless steel lined with .25" lead (.64 cm) and .0625" aluminum (1.6 mm). This shielding combination attenuates gamma radiation, beta radiation and errant bremsstrahlung. 040-315 Liner, Poly Bag, 50/pkg.